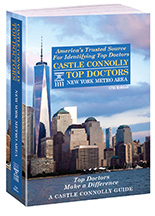 Each year, thousands of doctors and health professionals vote for the best physicians through a national survey conducted by Castle Connolly Medical Ltd, which is then published in Castle Connolly's America's Top Doctors®, a list that represents the top one percent of medical specialists in the U.S.
Montefiore's physicians are recognized annually in America's Top Doctors®, and in 2014, 351 Montefiore physicians were named in the regional edition, Castle Connolly's America's Top Doctors: New York Metropolitan Area, for providing exceptional care in various specialties, including Oncology, Cardiology and Pediatrics. The doctors selected, as leading doctors in the region, were among thousands who had been nominated by their peers and judged on various criteria. The Top Doctors selections are based medical skills, professional achievements, board and medical certifications, percentage of clinical practice activity, administrative posts, malpractice or disciplinary history, national medical reputation and accessibility for appointments, among other criteria. Castle Connolly, a nationally renowned leader in market research, reaches millions of readers through guides that list top physicians and through partnerships with America's top magazines. Castle Connolly's online nomination site is open to all licensed physicians across the country. Any licensed physician can nominate a maximum of ten physicians in his/her own specialty and up to three physicians in most other American Board of Medical Specialty-approved specialties during the course of a one-year period.